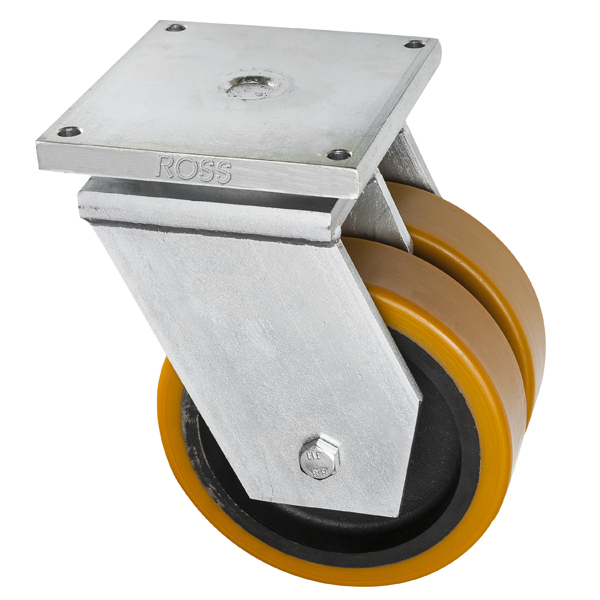 Our 8000 Series of extra heavy duty castors with a fabricated twin wheel are for extreme applications. These castors are thick plate steel,arc welded and chromatised for added corrosion protection. The swivel has a combination of shaft bearing and tapered roller bearing with a threaded king pin and safety locking nut. With castor load ratings from 1,100kg each up to 4 tonnes each, these fabricated casters are the backbone for gantry's, cargo and docks, refineries, marine applications, containers and furnaces.This castor has a cast iron core with a bonded and extremely durable polyurethane wheel.